Get Cashback when you buy from FarEastFlora.com! Far East Flora is a leading online florist in Singapore. Celebrate your special occasions with Far East Flora fresh cut flowers and beautiful gifts. The reliable flower and gift delivery services provide urgent same day deliveries in all four corners of Singapore. Far East Flora delivery services are available on Sundays and public holidays too. Far East fresh cut flowers are sourced from reputed farms and transformed into stunning floral arrangements by their skillful florists. They feature a user-friendly website that allows you to browse through a wide range of Far East Fcut flowers and adorable hamper options that you can order in an easy way. You will be able to find several kinds of rare plants and flowers on the website. Also, they offer special sales for Christmas occasion and provide you a hassle-free Christmas tree delivery as well as removal options. Far East Flora Christmas trees are the freshest Noble Fir Christmas trees imported from USA that add a touch of finesse to your merry season celebration. Far East Flora Holdings Pte Ltd was founded by 3 brothers in the year 1965. In 1978, they formed the first flowers and gifts department. 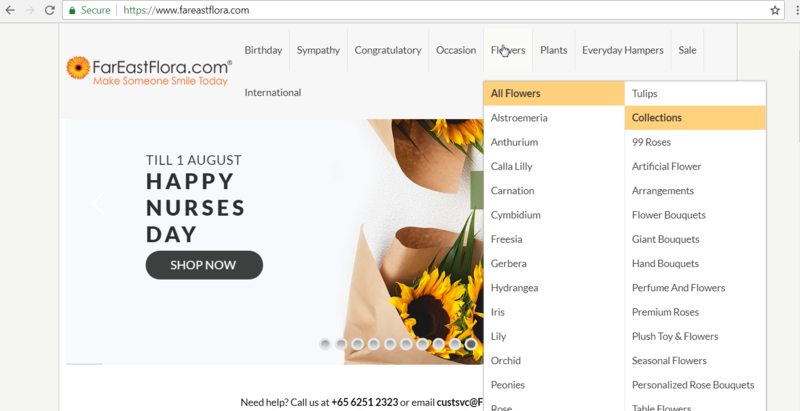 In the year 2000, this department launched its online flower store and incorporated FarEastFlora.com. The Valentine’s Day sales in 2001 was 4 times that of the year 1999. In the same year, they set up Comprehensive Customer Relationship Management (CRM) and Enterprise Resource Planning (ERP) systems. By 2002, Far East Flora Pte Ltd was conferred with the 3rd Annual Intelligent20 Awards. In the year 2005, they expanded their business into mobile commerce and also, launched world’s first full-colour printing on fresh flowers. Going through this successful journey, they achieved the Singapore Service Class certification in 2006 and in 2009, they launched their first retail store at City Square Mall in homeland Singapore. To add to their list of achievements, SG Florist has been listed under Top 30 Lifestyle Apps in iTunes stores during the month of January and February in 2012. Birthday: Surprise your mates on their birthdays with Far East Flora’s gorgeous birthday collection. They have an unbeatable selection of fresh flowers paired with delicious cakes from Marriott Java+, Crown Bakery, Hilton D9 Bakery or Bakerzin. Far East Flora bouquets are made with brightly coloured fresh flowers. Also, you can opt for birthday hampers filled with heart-warming gifts, sweet treats and indulgent wine. Sympathy: Convey your deepest condolences by sending a floral tribute and honour the life of a loved one. Far East Flora offers a wide range of sympathy and funeral flowers. Congratulatory: Express your joyous feelings on your friend’s or relative’s accomplishments by sending them congratulatory flowers or grand opening stands. The congratulatory bouquets include favourites such as gerberas, roses and lilies. Occasion: Far East Flora offers a wide range of flowers and gift choices for several everyday occasions like anniversary, birthday and retirement as well as seasonal occasions such as Chinese Valentine’s Day, International Friendship Day and Summer Seasonal Blooms. You can pick and send a flower/gift option of your choice and commemorate the occasion. Far East Flora wreath can be used as a decorative element during the occasion of Christmas. Flowers: Customers can pick a particular category of flowers or a collection specific to the occasions on which it is being sent. You will find ample of rare and gorgeous flower options from Far East Flora nursery that include alstroemeria, hydrangea and peonies and collection include 99 roses, giant bouquets, table flowers and so on. Plants: Far East Flora plants allows you to decorate your indoors and outdoors in a unique way. They provide a range of beautiful plants including orchids - as a symbol of good fortune, Feng shui plants for attracting positive vibes and succulent plants that add ornamental value to any space. Everyday Hampers: Browse for Far East Flora hamper on the website and elevate the celebration to the next level. You can buy a variety of hampers loaded with exceptional ingredients that include Far East Flora baby hamper, anniversary hamper, chocolate hamper and so on. The Far East Flora site has a simple interface for an easy and convenient shopping experience. The top section of the homepage consists of three different tabs that include track order, sign in and shopping cart. The search box on the homepage makes it easier for you to find certain products or specific collections. Fareastflora.com consists of different tabs for various categories under which the products are listed. Browse a particular category and you will be able to see a list of sub-categories on the same page. Select the specific sub-category based on your requirements. You will be redirected to the page based on your selection. Select a product of your choice and you will be redirected to the product listing page. Check for the product details including gift options and delivery date and click on ‘Add to Cart’ button to add the product to your shopping cart. If you want to browse more and add products to your cart, click on ‘continue shopping’. Before proceeding to checkout, enter Far East Flora promo code in the promo code/gift card text box on the page, for better discounts. Now, click on ‘Apply’ button and continue for checkout. If you do not have the code, just review your item on the page and click on ‘proceed to checkout’ button to complete your order. You will be redirected to the checkout page. You will find several options to proceed your order for delivery. You can also place your order by phone using the telephone number mentioned on the page. If you have an account on Far East Flora, login with your credentials under ‘Returning customers’ column. If you are new to Far East Flora, you can click on ‘Create an Account’ and sign up for a new account, or you can just proceed as a guest user by clicking on ‘Continue as a Guest’ button. Also, you will be able to see your order summary on the right side of the page. On proceeding, enter the shipping details of the recipient. You can make use of the self-collect option by clicking on ‘Self Collect’ checkbox. Also, you have options to add a gift message too. Click on ‘Continue’ to proceed your shipment. Now, you will be able to review your order summary. By clicking on ‘Continue’ button, proceed to your billing and payment options. DBS PayLah: You can use this personal mobile wallet and make your payment via your mobile number. This is one of the easiest ways for making your payment and place your orders. AMEX: You can choose your method of payment using AMEX purchase card. On choosing AMEX option, you will be redirected to the secured payment gateway. Click on the AMEX card logo and enter the particulars of your AMEX Purchase Card Account and click on ‘Pay’ button to complete your purchase. PayPal: You can buy items on Far East Flora and make payments via PayPal website. It is one of the most popular online money transfer system. Master Card/Visa: You can make your payments via Visa or MasterCard. Far East Flora ensures security for your financial details. Far East Flora is the right place for an array of discounts and deals during sales. You can use the Far East Flora promo or Far East Flora coupon to avail such exclusive offers on your orders. You can apply your fareastflora promo code during checkout process and earn the discount on your purchase. You will also find quite a few great deals under the Sale category on the homepage. This website has a user-friendly interface. Here is the step-by-step procedure for redeeming your coupons and vouchers for discounts on your shopping at Far East Flora. Step 1: Select the item/items that you wish to purchase and click on ‘Add to Cart’ button. Step 2: Proceed to the checkout page and review your order. You will find ‘Promo Code/Gift Card’ text box at the bottom of the page after your product listing. You can enter the fareastflora promo code here and click on the ‘Apply’ button. Step 3: Once your fareastflora promo code is applied, click on ‘proceed to checkout’ button to continue with your billing and payment options. ShopBack offers up to 3.5% cashback for new customers and up to 2.00% cashback for existing customers. Follow the steps mentioned below to earn cashback from ShopBack. Step 1: Visit the ShopBack website and select FarEastFlora.com that is listed on the homepage. Else, you can use the search box to find the link to Far East Flora store. Step 2: Click on ‘Activate cashback’ option on the top left corner of the page. A screen pops up and asks for your ShopBack account details. If you are an existing user, log in with your credentials or sign up to create an account in ShopBack to activate the cashback. Once you enter the details, you will be redirected to the official website of Far East Flora. Step 3: Click on Deals and Coupons to find more interesting discounts. Step 4: Click on ‘Refer 2 Get $10’ on the top right corner of the page, to earn $10 by referring 2 persons. Use only the promo codes that are featured on ShopBack to avail the cashback offer. The cashback is not applicable for gift card purchases, store app purchases and for returns, exchanges & cancellations. If your orders are placed before 5PM, they guarantee that it will be delivered on the same day of your booking, within Singapore. Different types of delivery options are available, ranging from normal delivery (excluding deliveries to restricted/remote locations) to 2-hour express delivery (additional fee apart from the normal delivery charge). Also, they deliver products across the world, in over 150 countries. To deliver the items overseas, it will take around 2 to 3 business days to process and complete an international delivery. If you have received the products in an unsatisfactory condition, you can return within 24-hours of receiving your floral arrangement. For non-perishable items, contact the customer care team within 48 hours of receipt. FarEastFlora.com issues a refund for your order within 14 days of your refund request. For any queries, you can email them at [email protected] or reach out to their customer service team directly at (65) 6251 2323. Their customer service representatives will assist you for any order issues.